The George Medal (GM) is the second highest civil award of the United Kingdom and Commonwealth. It ranks below the George Cross. It is only awarded for non-combat acts of bravery. 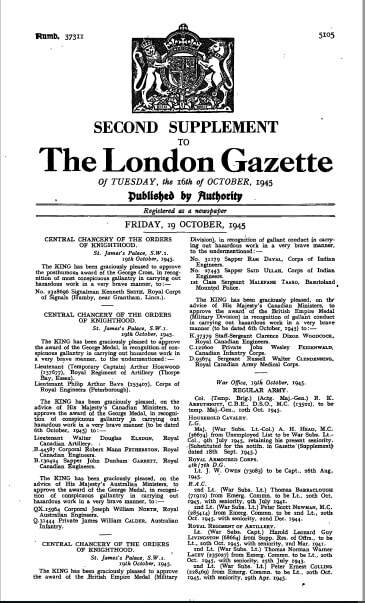 The GM was created on 24 September 1940 by King George VI. At this time, during the height of The Blitz, there was a desire to reward acts of civilian courage. It was decided that the George Cross and the GM would recognize civilian bravery in the face of enemy action and brave deeds more widely. "In order that they should be worthily and promptly recognized, I have decided to create, at once, a new mark of honour for men and women in all walks of civilian life. 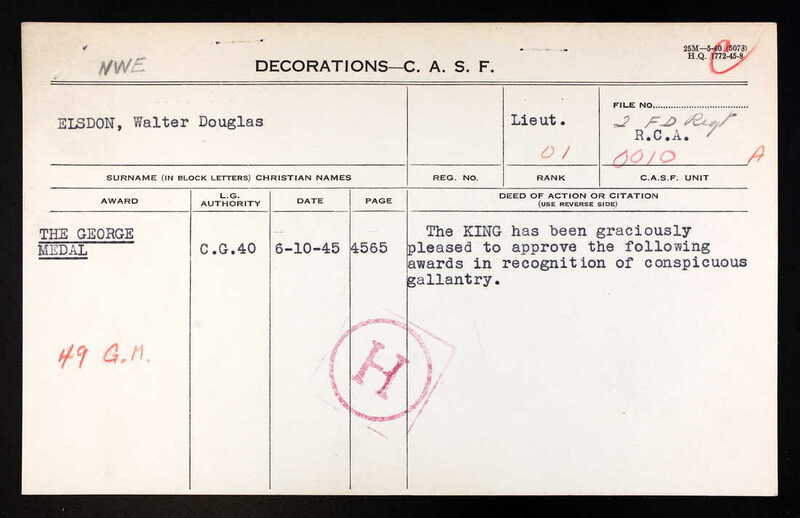 I propose to give my name to this new distinction, which will consist of the George Cross, which will rank next to the Victoria Cross, and the George Medal for wider distribution". The Warrant for the GM was published in the London Gazette on 31 January 1941. The medal is granted in recognition of "acts of great bravery". 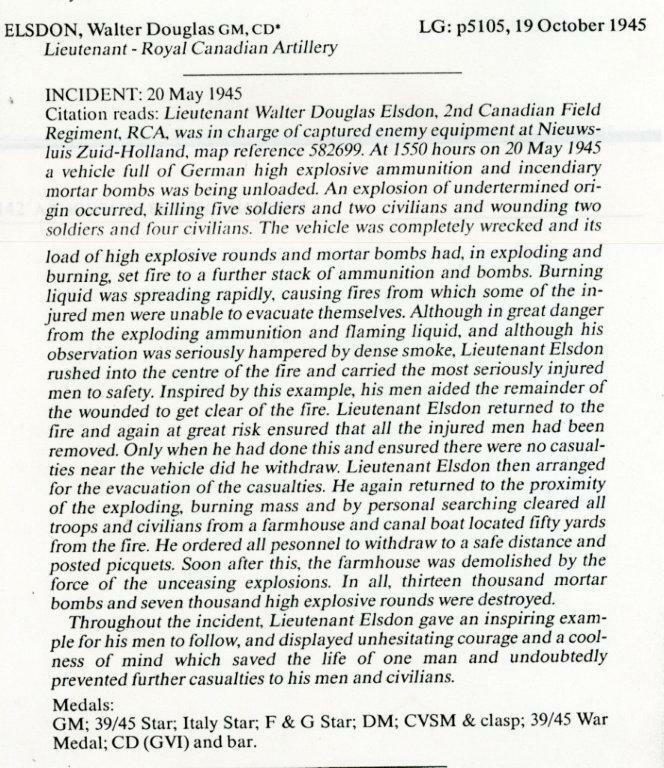 The medal is primarily a civilian award, but it may be awarded to military personnel for gallant conduct that is not in the face of the enemy. 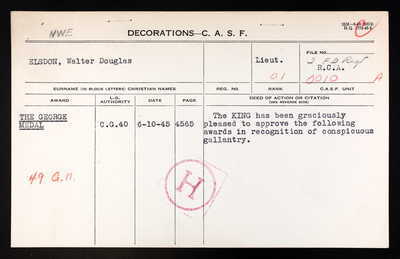 As the Warrant states: The Medal is intended primarily for civilians and awards to military services is to be confined to actions for which purely military Honours are not normally granted. Bars are awarded to the GM in recognition of the performance of further acts of bravery meriting the award. In undress uniform or on occasions when the medal ribbon alone is worn, a silver rosette is worn on the ribbon to indicate each bar. Recipients are entitled to the postnominal letters GM. 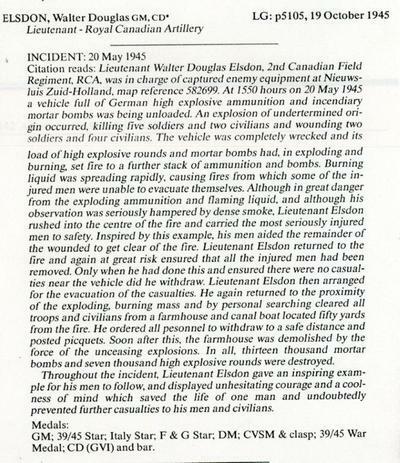 Lieutenant Walter Douglas Elsdon was with the 2nd Field Regiment, RCA in Holland when he was awarded the George Medal for his courageous actions on 20 May 1945 saving civilians and soldiers from the effects of a large ammunition explosion and fire.